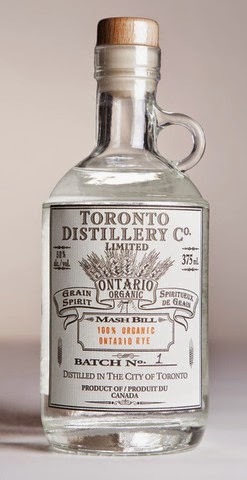 Ontario Craft Distillers Association: OCDA MEMBER SPOTLIGHT: TORONTO DISTILLERY CO.
OCDA MEMBER SPOTLIGHT: TORONTO DISTILLERY CO. The guys at Toronto Distillery Co. are up to good things. Co-owners Charles Benoit and Jesse Razaqpur are hard at work in the 'Junction' answering for this city’s severe lack of independently produced, local spirits. With a friendship that dates back to high school, they still stay up late, pull long hours, and do their homework, only now they’re singularly focused on making exceptional Whisky and Gin instead of on passing geography. And they’re wrecking the curve, as far as craft distilling goes. Their commitment to the finer points of the process is exemplary, and it shines right through. Clear as water, their 100% Organic Ontario Wheat or Rye Grain Spirits brag about their youth, not how old they are. Also called “new make” by savvy people who like proper terminology, these unique spirits derive all of their flavour straight from the distillation runs themselves, rather than from barrels. It begins with an exclusive mash bill – these gents won’t compromise on the ingredients they use. Unlike with larger distillers, if they say it’s a rye spirit, it’s a rye spirit. When they combine grains, they say so right on the label. It’s detailed right down to decimal-point percentages. No artificial flavours or colours, no posturing, no nonsense. 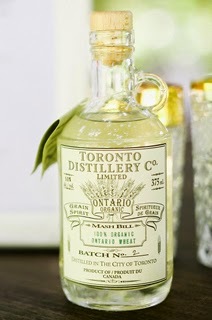 Toronto distillery Co. is also certified organic, so you know you’re getting the good stuff. As distillation begins, Charles and Jesse seek out a sweet spot in the process with the precision of surgeons. This sweet spot – called the heart – produces the truest expression of all that grain, and this is all they want to bottle, all they want to offer. The resulting new make promises the purest experience of the grain’s potential, unmitigated by barrels, and uninfluenced by age. It stands to reason that the uncompromising whisky lover owes it to him- or herself to try this. For the cocktail enthusiast, Toronto Distillery Co. offers up their distinctive J.R’s Dry Organic Canadian Gin. The bottle design seems to say it all: this not your average, mouthwashy gin. This is an elixir. Sitting at 45% alc. / vol., it is made to seriously enhance martinis and impress your date. Carefully prepared with herbs and juniper berries sourced from Ontario, this spirit stands out in that the recipe’s botanicals are left in the pot during distillation, which allows their flavours to cohere more subtly and smoothly in the final product. Explore its complexity by drinking it neat, which, of course, is recommended. Like the other members of the OCDA, Toronto Distillery Co. is all about quality, honesty, and transparency when it comes to their business. And they want to prove it to you. Their doors are open for tours and tastings so that you can go learn more about their methods and the principles that guide them. Sample bravely and don’t look back. It’s obvious that Jesse and Charles believe that there is an art to distilling, and that the best way to achieve its fullest expression is through focus and attention to detail. They privilege ingredients and process over additives and profit. These are purposefully small-batch, all-organic, true Ontarian spirits. The good old days of your grandfather’s whisky and your grandmother’s gin are behind us. These are the brand new days of craft distilling in Ontario, and they’re being heralded by Toronto Distilling Co. Visit WEBSITE.